2014 Week 45, 46, 47, 48, & 49: new condo, I like you elotes. Whirlwind life! I have good reasons to be weeks behind on the La De Blog. Even though I have been SO busy, I managed to make four new products for the winter fair season: 2 new VV tea towels, the elotes greeting card, and hedgehog gift labels. Z and I have been getting used to being homeowners. Our neighbors are nice. oving from Ukrainian Village to Logan Square has been a big adjustment, but we’re getting there. First week at the new place. Dropped off at new stockist Blue Door Farmstand! Music Box. 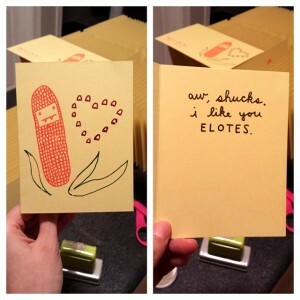 Sold at DIY Trunk Show. Had an indoor yard sale. Fat Willy’s/City North with Z, Ed, & Heidi. UVNA member meeting. Picked up pies at Hoosier Mama. Friendsgivings at Jess & Dave’s, Kirstie & Jason’s, and Jen L.’s. Christkindlmarket. Sold off last of yard sale stuff. Mega cleaned the old place. Picked up Letters to Santa letter from the USPS. Sold at Renegade Craft Fair Chicago Holiday @ Bridgeport Art Center. RCF After party. Letters to Santa shopping. Lunch with Eliza. 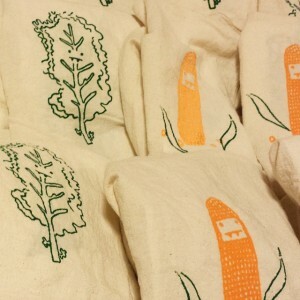 Printed a hell of a lot of Veggie Vampire Tea Towels! Alison’s Bday dinner @ Chicago Diner. Picked up wine rack to use as tea towel display! Z work holiday party at the Gage. Got everything ready for the Boohaus holiday/housewarming party. Party! Leah & Tim’s party. Sold at Revolution Craft Show @ Revolution Brewery. Ian’s going away potluck. Letters to Santa shopping with Amanda. New Jason Anderson album dropped and you should go download it now – Cold Cold Rain http://jasonanderson.bandcamp.com/ ! Made no bake cookies for holiday party and dough for Kimmi’s cookie party. House Theatre’s The Nutcracker at Chopin Theatre. My work party at Aberdeen Tap. Made cookies Friday night and dropped them at Kimmi’s Saturday morning. Sold at Hideout Holiday Sale. Drove straight to USPS. Z and I ate dinner at Urban Vegan. Went to Kimmi’s and met more of her lovely family and picked up cookie booty! Lunch with Dan Somen @ Honey Butter Fried Chicken. Erranding. Reba hogtorial. Wrote our holiday cards, wrapped all of our gifts. So many good movies. All of these were enjoyable to some degree, even Santa Claws, though Z would tell you otherwise.